This recipe for old-fashioned molasses drop cookies makes a soft, thick cookie that is even better the second day… if there are any left to make it that long! This cookie also freezes well. I have been baking this version of molasses drop cookies since I was about eight years old. I think this was probably the very first cookie I ever made. I started making them because of an elderly aunt who was very fond of fresh baked cookies… especially these molasses drop cookies… who would always ask me to make them for her. I still use the recipe I copied at that time, written on a sheet of notebook paper in my childish handwriting. 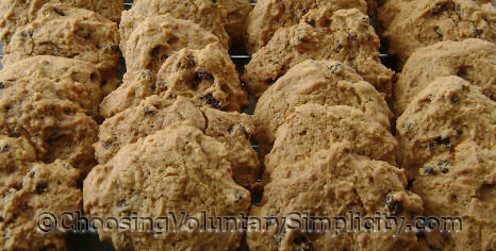 The original version of this cookie did not include raisins in the ingredients, but I have always added them… it’s a great cookie without raisins, but even better with! Cream shortening and sugar. (I use a small hand mixer.) Add molasses. Add well-beaten egg. (This is when I add the raisins.) Sift the dry ingredients and add alternately with the milk. Stir the mixture just enough to blend all the ingredients. Drop by teaspoonfuls on cookie sheets (greased). Bake for approximately ten minutes in a 350°F oven. Test for doneness by pressing on the top of a cookie. If no imprint remains, the cookies are done. Yield: about three dozen 2 1/2 inch cookies. I’m so glad I saw this post. We’re having a family picnic tomorrow and I needed to bring dessert so I have decided I am going to bring these cookies. They look delicious. Thanks for sharing your recipe. My gran used to make these. I remember how good they were and I can’t wait to make some. These are excellent. I made them exactly the way you do (with raisins) and I used butter. I took them to work yesterday and several people wanted the recipe and everyone said how good they were. My daughter referred me to your blog. 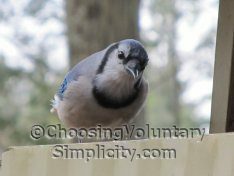 I’ve only read ‘Why We Chose Voluntary Simplicity” and found it very interesting. I look forward to reading more and trying the molasses cookie recipe. These look just like the ones my Aunt Marg used to make very often. I really loved them and I am really glad I found this recipe. None of the other ones were quite like these.